EDUCATED is the true story of a young woman escaping her abusive family through education. Raised in rural Idaho by her family of survivalist Mormons, Tara Westover survives brutal years working in her father’s scrap yard and on construction sites, all while never setting foot in a classroom for the first 17 years of her life. Tara’s father believes teachers to be instruments of a shadowy cabal involving the Illuminati. He distinguishes between them only by those who know that they are active tools of the Enemy and those who are unwitting drones of the perfidious enemy. Everything about this book was handled in a serious and articulate manner, including an author’s note that religious beliefs are not the subject of her first work. Many characters of her book are religious, and some motivations may be ascribed to their religion, but a direct correlation in any direction cannot and should not be divined. Her book deals with a great many serious situations without looking away, and avoids the easy road of blaming religion for her suffering. Throughout her memoir, Tara struggles with the inaccuracy of memory. Brutal assualts are waved off as if they never happened, and the truth is twisted into traps that one might call “gaslighting”. Significant events are recounted from several viewpoints, with footnotes identifying inconsistencies in the story and dispassionately identifying the contributing party. Throughout her life, Tara tests her memory against that of her family, attempting time and again to discern the truth in the stories that she tells. For instance, the book opens with the brutal assault on Ruby Ridge, an eleven day siege which is repeatedly recounted to her by her family until she imagines the story as one in which her family was intimately involved. Ruby Ridge appears as the tipping point that sends her father from suspicious to convinced that an assault from the Federal Government was incipient. From there the stockpiling, planning and withdrawal of the children from public school was a small step for the Westover family. To uncover her origins, she returns to the stories she has been told. Tara traces her life back to her parents meeting, showing how her mother’s rebellion against a small-town sense of propriety propelled her into the arms of a serious young man who would grow into the towering patriarch of the Westover clan. It is suggested that he suffers from bipolar disorder with paranoid tendencies. Tara is quick to note that the very thing he suffers from will keep him from diagnosis, as Western medicine is anathema to him. Equally abhorrent to him is the idea of his children departing their insular community for an education. Tara first finds her desire for an education when her older brother Tyler, to whom the book is dedicated, leaves for college against the express wishes of her father. Tyler helps her prepare for the ACT and assists her in faking records to indicate that she was homeschooled by her mother. Accepted into Brigham Young University, Tara finds herself adrift in a strange world, bereft of the common knowledge that most 18-year olds hold in their heads. Despite all the forces arrayed against her, she prevails. Her strength of character is often tested, but she endures. 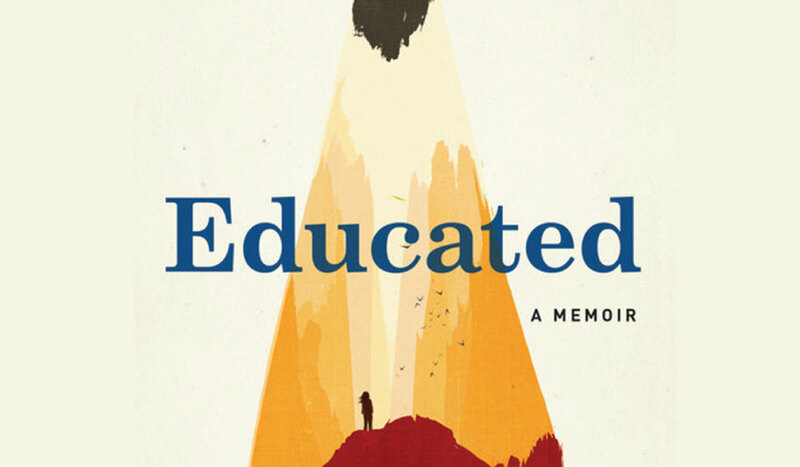 EDUCATED is an incredible book, for the circumstances and the story, but also for the brilliant and rythmic manner in which the story is conveyed. Weaving throughout her story are the themes of home, represented in part by a rocky outcrop on top of the mountain adjacent to her homestead. The Indian Princess, as the statuesque mountainside is known, reappears throughout her story, much as the mountain reveals the Princess when the snows of winter subside. In contrast to the passive beauty of the mountain, the dysfunction of her family is a stigma, hidden from the world by their reclusive and mistrusting nature. Ensconced as she was at the bosom of her misordered family, it is stunning that she left. If you read only one memoir this year, make it this one.